Below you will find a general reference of the types and styles of complete uppers available from various manufacturers. When choosing an upper keep in mind that the prices vary quite a bit. 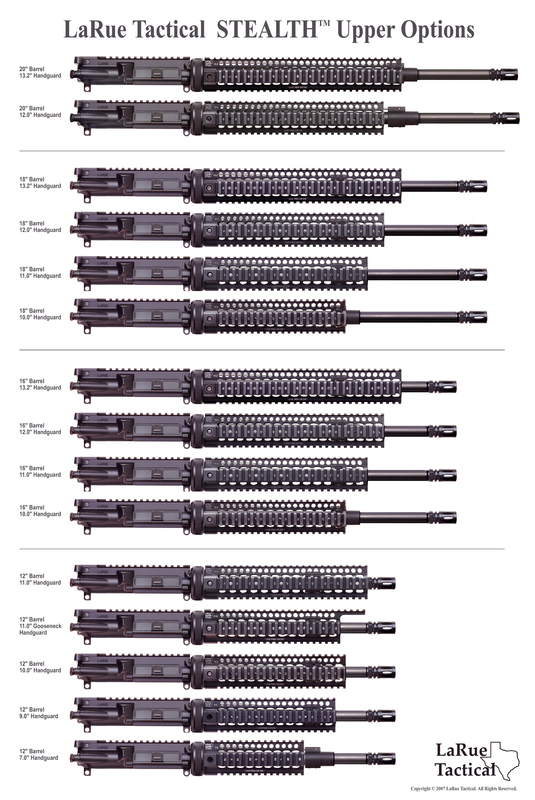 In most cases the more expensive units have better barrels and or handguard's. Also be careful you don't violate local laws with your selection of uppers. Lastly there is a shortage of all things AR15 and regardless of where you order your upper your going to most likely wait a year or more. I suggest just get a few on order with your suppliers of choice and be surprised when UPS drops them off in 18 months. Designed as a highly-accurate duty & service upper for those who prefer a precision rifle with a mid length gas-system, combined with a traditional fixed-front sight base. Assembled using our CNC-machined Stealth billet 7075-T6 upper receiver (LT-007) as the backbone, the DMR-16 has a 16" Ion-Bonded LW-50 stainless steel barrel, spacious 9.0" free-float handguard, Mil-Contract M16 Bolt Carrier Group and Charging Handle. Just attach to your favorite lower and you're ready to roll. Every LT Stealth Sniper System is precision-assembled and as part of the QA procedure, goes through a final 10-round live-fire function test before being tube-packaged. Complete, flattop upper receiver comes fully assembled and ready to install. Built around an extra-strong 7075 T6 aluminum forging machined to exceptionally tight tolerances. 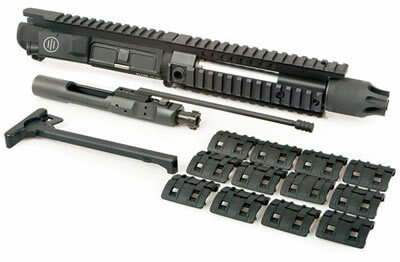 Includes bolt and carrier, forward assist, shell deflector, and spring-loaded ejection port cover. A MIL-STD 1913 Picatinny receiver rail lets you mount a scope, red dot, or other sighting device—even a detachable carry handle. White, laser-etched alpha-numeric position markers in the rail slots enable temporary removal and reinstallation of sights without loss of zero. Match-grade barrels machined from extra-hard 410 stainless steel are heat treated to relieve internal stress in the steel’s grain structure to prevent point-of-impact drift during sustained fire. Stainless barrels are fluted to provide the rigidity of a bull barrel without the weight penalty. 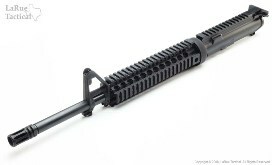 Barrels have M4-style feed ramp to aid in smooth, reliable chambering of each round. COMPETITION DELUXE - 18" barrel chambered in 5.56mm NATO, mid-length gas system, and flip-up rear sight with long- and short-range apertures. Low-profile steel gas block with integral flip-up front sight, bayonet lug, and sling swivel. Handguard aligns with receiver rail to provide 15" of uninterrupted upper rail space, with 9" on the left, right, and bottom handguard rails. Plenty of S-shaped vent holes reduce weight and provide maximum air flow to cool the barrel during heavy fire. “Shark gill” flash hider/muzzle brake tames felt recoil control and virtually eliminates muzzle rise for fast follow-up shots. Complete, M4-style flattop upper receiver comes fully assembled and ready to serve as the top half of a rugged, finely tuned tactical carbine that will handle the most rigorous operational requirements. Receiver is forged from 7075 T6 aluminum for maximum strength and rigidity—nearly twice the tensile strength of standard 6061 alloy—and includes bolt, carrier, forward assist, shell deflector, charging handle, ejection port cover, and MIL-STD 1913 Picatinny rail. Four-rail, free-float handguard has plenty of ventilation holes to help keep the barrel cool and a continuous upper rail that aligns with receiver rail to provide 13" of uninterrupted rail space for maximum flexibility in mounting a scope or red dot sight. Removable bottom panel allows installation of M203 grenade launcher, shotgun, or tear gas launcher. Rail slots have white, laser-etched alpha-numeric position markers to enable temporary removal and reinstallation of sights without loss of zero. Yankee Hill flip-up front and rear sights are designed to co-witness through many non-magnifying optics. Windage-adjustable rear sight has A2-style long- and short-range apertures; front sight on the low-profile gas block has A2 post, bayonet lug, and sling swivel. M4-contour, 16" barrel of long-wearing chrome-moly-vanadium steel alloy is chrome lined for maximum bore life and chambered in 5.56mm NATO. “Shark gill” flash hider/muzzle brake virtually eliminates muzzle rise for fast follow-up shots; recessed target crown protects the rifling. Complete, flattop upper receiver comes fully assembled and ready to install. Built around an extra-strong 7075 T6 aluminum forging machined to exceptionally tight tolerances. Includes bolt and carrier, forward assist, shell deflector, and spring-loaded ejection port cover. A MIL-STD 1913 Picatinny receiver rail lets you mount a scope, red dot, or other sighting device—even a detachable carry handle. White, laser-etched alpha-numeric position markers in the rail slots enable temporary removal and reinstallation of sights without loss of zero. Match-grade barrels machined from extra-hard 410 stainless steel are heat treated to relieve internal stress in the steel’s grain structure to prevent point-of-impact drift during sustained fire. Stainless barrels are fluted to provide the rigidity of a bull barrel without the weight penalty. 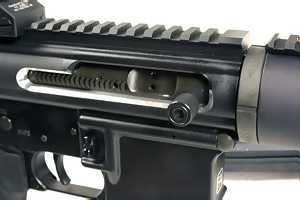 Barrels have M4-style feed ramp to aid in smooth, reliable chambering of each round. 20" barrel chambered in .223 Remington, with flared muzzle (no flash hider) and recessed target crown. Includes mid-length gas system and rifle-length tubular free-float handguard that won’t put accuracy compromising stress on the barrel. 1-8" twist rifling stabilizes a wide variety of bullet types. Swivel stud; no sights. Fulton Armory offers some of the most accurate uppers on the planet. Match grade Krieger and Douglas Barrels used extensively. Unfortunately their web site is a bit unfriendly to my browser so I'll host the catalog here. For easier round chambering Fulton Armory offers the awesome "Side Cocking" Upper as on option od most upper receivers. 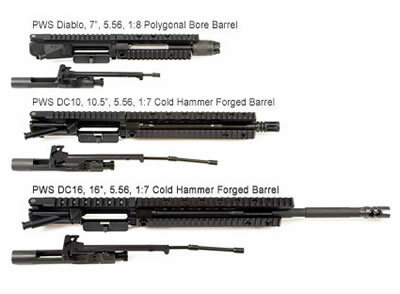 DPMS barreled receivers, complete with charging handle and hard-chrome bolt carrier assembly, let you change your AR-15 from a sporter to a match rifle or long range varminter in just minutes - or add to your lower receiver to complete a parts gun. Furnished with a pre-ban barrel in 1-9" twist, each unit is complete with an A-2 flash suppressor and front sight housing with bayonet lug. Bull barrels are non-threaded, post-ban style. 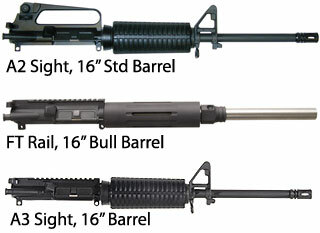 Standard (Std) barrel units include front sights. 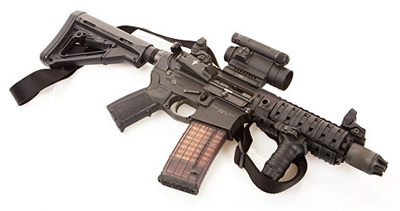 A unique design in the ever widening market of piston driven AR15 uppers, PWS has designed a simple, yet very robust series of uppers. Starting with the aptly named 7-inch “Diablo”, available in both 5.56 and 7.62×39, PWS manufactures a line of piston driven uppers that appear to be the perfect blend of AK reliability with AR ergonomics. This distinctive design results in a very smooth recoil impulse coupled with unyielding reliability. The carrier, operating rod and gas piston are effectively one component which leaves no need for additional springs, small pins, or adjustments of any kind. Built with only the highest quality components and exacting tolerances, an excellent platform for duty or competition use has been born. Visit www.primaryweapons.com for more information.